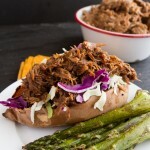 Slow cooker shredded pork (or beef) made with stevia-sweetened natural Ginger Root Beer, honey-sweetened barbecue sauce and a simple blend of dried spices. Remove the twine from the shoulder roast and place in your slow cooker. Sprinkle the roast with paprika, garlic powder and onion powder. Pour the root beer along the side of the pork. Cover and cook, on low, for 9 hours. Drain the juices from the slow cooker, return the meat back to the slow cooker, shred with a fork. Stir in barbecue sauce and cook on low for 1 hour. Serve with a roasted sweet potato and veggies or a gluten-free wrap, bun or bread. Root Beer: Any root beer here will do the trick. I used stevia-sweetened ginger root beer. Barbecue Sauce: Any barbecue sauce would do the trick. I used a honey-sweetened (local) barbecue sauce. You can also make your own using this sugar-free barbecue sauce recipe. Pork vs. Beef: to make this recipe leaner, swap out the pork for a sirloin roast. You can keep all of the ingredients the same except you’ll need 4 cans of root beer and you’ll need to cook on low for 12 hours instead. 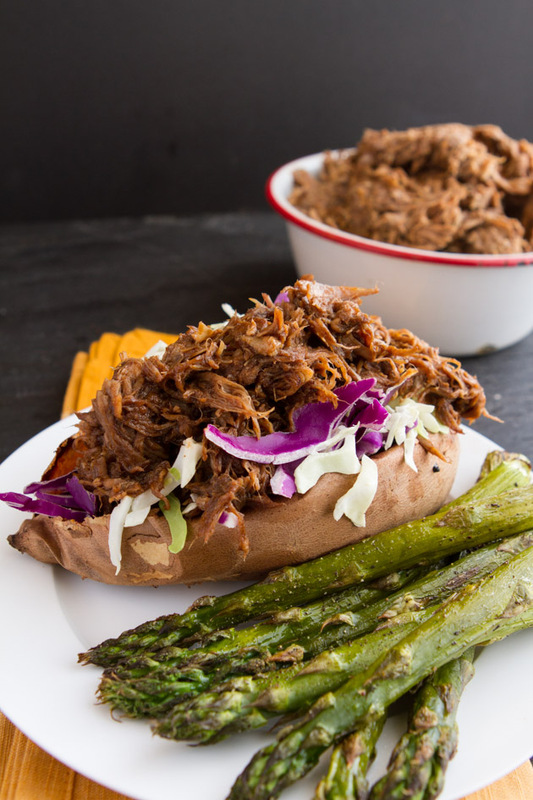 Carb Up Option: Add half a serving of pork to a sweet potato with some shredded cabbage as the perfect carb up; the nutrition information does not include the sweet potato, cabbage, or asparagus featured in the photo. For more info on carb ups, check out this post.